Taken a few seconds apart, they are virtually identical except for Jennifer’s hand placement. The Black & White version of this photograph is famous (available as a poster, it remains a seminal image from the early 70’s) while the color-version is not. What makes the difference is the virtually subliminal image the second image conveys. In the movie, Jennifer plays a wife who’s husband is engaged in WWII. She is lonely, waiting for word from her husband while living in a beach house over the summer during one of the worst chapters in the war’s history. Her wedding ring in the second photograph is visible wherein the first image it is not. And it makes all the difference in the photograph, the character in the story and in the classic film. 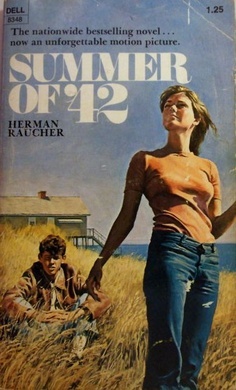 Summer of ’42 is a novel by Herman Raucher which the film was based. It was shot in 1969-70 and released in 1971. The film catapulted Jennifer into stardom, as much for her wholesome looks (the hope of a generation of Americans some have called the greatest) as for her action – which my opinion is superb. In fact, Jennifer would go on to act in almost 30 films throughout the 70’s and early 80’s but never again attain the starry heights of Summer of ’42. Jennifer is a contemporary of Katherine Ross, Charlotte Rampling and several other actresses I’ve covered in this blog. What sets her apart is that Summer of ’42 was her movie, a star-making vehicle if there ever was one because the audience felt her pain and sense of loss while at the same time taking solace in the arms of a very young paramour during a summer infamous for death. She is so young, so alive and so beautiful that she embodies the hopes and ideals of what that generation of Americans stood for. At the same time, the subject matter was highly controversial because it portrayed an affair between a married woman (albeit war widow) and an under-age boy. By today’s standards the film’s so-called love scenes are chaste, but back in ’71 it was hot-stuff. And even today, no man can deny watching the movie that having an affair with Jennifer O’Neill in a summer house would be an affair to remember – under any circumstances. Summer of ’42 is a beautifully-shot movie with an absolutely gorgeous actress in the prime of her youth and career. It is one of those rare cinematic occasions where you literally can’t imagine anyone else in the role. Sure, it has been remade in various incarnations since then – but none were able to replicate the magic. I think this is in large part to Jennifer’s ability to captivate with her performance as much as her looks. Even more, it is saturated in the hues and values of summer – that special time we all slow down, enjoy the sun and beach and invariably reflect on our lives; what’s been, what is and what will be. And for me, that’s the magic spell summer and Summer of ’42 cast no matter what the generation is watching it. One more shot of gorgeous Jennifer and Happy July 4th! Interesting observation about that movie, Summer of ’42, being her zenith. I totally agree. From what I read, she spent 12 & 1/2 minutes on screen. That’s star power.